I pull my jacket close around me as the tuk-tuk zips along Highway 212 towards my destination, Sala Kaew Ku, near Nong Khai in northeastern Thailand. The air is cold and damp under the blanket of grey cloud, and whips my face like winter winds do in Canada, so by the time we turn off the main road and head down the soi that leads to the parking lot, my whole body is shivering and my lips are dry and cracking. The driver pulls up in front of the tree-lined entrance, saying that he would wait. I step out of the 3-wheeled vehicle, and then enter the fascinating world of Sala Kaew Ku. Sala Kaew Ku, located 3km outside of Nong Khai, is a huge garden filled with large and unusual concrete statues of Hindu and Buddhist deities, including Vishnu, Shiva and Buddha, some of which are several storeys high. This shrine was created in 1978 by a man named, Luang Puu Bunleua Surirat (Venerable Grandfather), a Brahmanic priest-shaman who lived in Laos before moving to Nong Khai, and who also had a large following in the area. 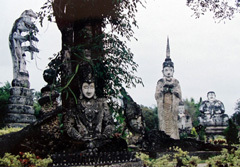 A similar shrine, which he built more than 20 km south of Vientiane in Laos in 1958, still exists today. I begin my exploration of this outdoor temple, walking alone along the maze of pathways that crisscross the garden filled with beautiful flowers, plants and shrubs, amazed at the bizarre statues. There are very few people in the garden; the atmosphere of the shrine matches the sky above — dark, somber and grey, and I begin to feel chilling ripples running down the back of my neck. Some of the effigies are benign while others are definitely more sinister. 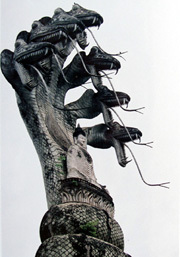 I look up at the frightening statue of the seven nagas, arching above me 25 metres high, their razor sharp teeth and long forked tongues keeping watch over the smiling Lord Buddha in their care, looking like seven Tyrannosaurus Rex heads about to reach down and pluck me off the ground in one chomp, rather than the mythical serpent that lives in the waters of the Mekong River. 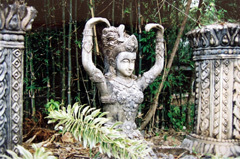 I continue my exploration, finding smaller statues of gods and goddesses intricately carved, covered with the dark mold of time, nestled amongst lush green bamboo. One goddess, wearing an elaborate costume and headdress all made out of concrete with a bindi dot on her forehead, sits majestically, her arms raised above her head as if she is dancing, her hands elegantly curved back. A huge double-headed god with a large nose, high cheekbones, thin lips and expressionless eyes stands next to a smaller statue of a god that looks like a warrior dressed in an intricately-detailed costume, with one hand on his hip and his other brandishing some kind of weapon. Pulling my hood over my head, I follow the path as a light rain begins to fall, coating the effigies and the luxuriant green plants in a light mist. I pause in front of a huge figure with chubby cheeks and a laughing smile, whose round belly gives him away as a Chinese Buddha. Then, I pass a tall Buddha figure that has long curving earlobes almost touching its shoulders and a soaring spire on its head. A smiling goddess with curvaceous hips, dark eyes, and cheeks the size of large tomatoes meets my gaze. Her ten waving arms, holding shafts, clubs and a large pitchfork, look like spider legs extending out from a giant body poised to run. 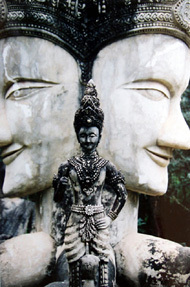 A little further along, I notice a reclining Buddha almost black with age, again fashioned with an intricately carved costume and headdress with a bindi dot displayed prominently on its forehead, lying with its eyes closed, its head resting lightly on its upturned palm, as if was sleeping peacefully or its mind lost in daydreams. The rain begins to fall harder and I make the difficult choice to return to the tuk-tuk, and to town. The statues glisten under the shower of water, and on one sculpture the rain falls as tears down her cheeks. Feeling remorseful, I take one last glance as I climb into the vehicle, leaving the statues whose faces are filled with such character, to be weathered and blackened with rain and with time.